Although our review comes very late compared to its intended date, this book has been on our reviewers’ minds since they first saw it. It 'blew us away'! The book has been read by five of our editors; that's never happened before. We are proud to name After the Pretty Pox: The Attic the first ever Editors’ Pick from our editorial panel at e-scribes.com. It stood out for all of us, right from the moment of taking in the title. After all, whenever was a plague described as pretty before? When we receive submissions for consideration for an editorial review, rarely do we find several editorial reviewers—working for ‘big five’ publishers in their day jobs--proclaiming the book one of the best they ever read. That’s what happened here. I don’t recall ever having such a strong feeling about a book before, in fact. It stole my heart and imagination. 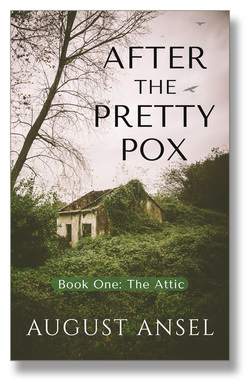 While many post-apocalyptic novels cleverly portray the visual and environmental devastation and the friction of the relationships and struggles ensuing, After the Pretty Pox: The Attic shows the deeply personal, gentle-paced, introspective sense of isolation and human suffering and then the overcoming of it. It depicts the second-by-second thoughts, turmoil, angst, questioning and horror of the post-apocalypse in such a real way, your hairs will stand high on your skin. Characters come alive with sentience; you can almost reach and hold them, and in fact, you’ll wish you could do so, to fold the suffering ones in your arms and deliver them to safety. Human relationships are so vividly portrayed that you find yourself asking; could it even be better to be as alone in the world as protagonist Arie is at first, or what do we really gain from being so enmeshed with the others around us? It turns the reader's orderly world on its head. To try and describe the book’s storyline and contents would be to do a disservice, because for us, this book is about everything; it's about each of us and the world we know--or, at least, the one thought we did. The world as we knew it has gone, and that's portrayed here better (in our view) than in other books of the genre; it conveys so strikingly, how--even if we make it out of an apocalypse alive--the brain has to decipher a way forward while dealing with the day-to-day practicalities. The freezing night, the searing sun, the hungry predators and the forlorn inner self. The book's major strength and captivating quality lies in the author's skill to make us feel at every turn. The language used is strikingly, hauntingly beautiful, relatively formal prose perfectly selected; in places, we found this a literary work of art, and we devoured and savoured each sentence while holding fast onto the next breath, hardly daring to exhale. As editors, we are used to reading novels and encountering superfluous words; you didn’t need to say that or you could edit out twenty thousand words are frequent thoughts to editors reading a manuscript. After the Pretty Pox: The Attic, conversely, is a wordsmith’s feast and that’s almost an irritation to an editor used to picking apart the seams of a book. Yet there is nothing pretentious about this novel; its words ripple through the reader’s mind like a calm stream, free of hyperbole and unnecessary affect. It does not need to try too hard; we find it sublime as it stands. Scenes of nature and the destroyed, devastated wilderness and all that inhabits its bleakness, are so realistic you can drink the water, touch the raindrop and feel the dry grass crackle beneath your feet. You taste the concoctions protagonist survivor Arie brings to her mouth, every ingredient alive on your tongue. Your spirit will lift and soar or find a dark corner in which to hide away; by the end, you will question everything you thought you knew about the end of the world, about death and decay, and about your own survival should this ever happen to you. A truly incredible, inspirational book and a feat of literary achievement, at e-Scribes, we all consider this is an outstanding, thought-provoking, self-questioning must-read. A reader-reviewer described this as a quiet read. We absolutely agree; it seems to have no pretences and carries no big ego pushing it from behind. It is the quiet, unassuming, yet deeply moving and insightful presentation of a disturbing new reality. You will only understand what we mean when you have opened it yourself. After the Pretty Pox: The Attic is the first in a series; while we find it stands alone, on its own merit, we will devour the second with equal relish.